FILE - A man uses a United Airlines check-in kiosk at San Francisco International Airport in San Francisco. The White House on Saturday sharply criticized China's efforts to force foreign airlines to change how they refer to Taiwan, Hong Kong and Macau, labeling China's latest effort to police language describing the politically sensitive territories as "Orwellian nonsense." Amid an escalating fight over China's trade surplus with the United States, the White House said China's Civil Aviation Administration sent a letter to 36 foreign air carriers, including a number of U.S. carriers, demanding changes. The White House said in a statement that President Donald Trump "will stand up for Americans resisting efforts by the Chinese Communist Party to impose Chinese political correctness on American companies and citizens." "This is Orwellian nonsense and part of a growing trend by the Chinese Communist Party to impose its political views on American citizens and private companies. 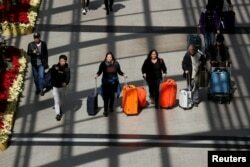 ... We call on China to stop threatening and coercing American carriers and citizens," the statement said. Taiwan is China's most sensitive territorial issue. Beijing considers the self-ruled, democratic island a wayward province. Hong Kong and Macau are former European colonies that are now part of China but run largely autonomously. The White House's sharp criticism followed contentious trade talks between senior U.S. and Chinese officials this week. FILE - Passengers leave Hong Kong International Airport in Hong Kong, Jan. 11, 2018. The Trump administration demanded a $200 billion cut in China's trade surplus with the United States by 2020, sharply lower tariffs and a halt to subsidies for advanced technology, people familiar with the talks said. "My group just got back from China. We're going to have to rework China because that's been a one-way street for decades," Trump said Saturday at an event in Cleveland. "We can't go on that way," he said, although he also said he has a lot respect for Chinese President Xi Jinping. Trump earlier this week praised his relationship with Xi, but there were no signs of significant progress at the talks on Thursday and Friday, raising fears of a trade war between the world's two largest economies. Trump has already proposed tariffs on $50 billion of Chinese goods, which could go into effect next month. A spokesman for Airlines for America, a trade group representing United Airlines, American Airlines and other major carriers, said Saturday that it was working with the U.S. government to determine "next steps" in the dispute about how airlines should refer to Hong Kong, Taiwan and Macau. In January, Delta Air Lines, following a demand from China over listing Taiwan and Tibet as countries on its website, apologized for making "an inadvertent error with no business or political intention," and said it had taken steps to resolve the issue. Also in January, China suspended Marriott International Inc.'s Chinese website for a week to punish the world's biggest hotel chain for listing Tibet, Taiwan, Hong Kong and Macau as separate countries in a customer questionnaire. The apparent intensification of efforts to police how foreign businesses refer to Chinese-claimed territories — even if only in pull-down web menus — underscores how sensitive the issue of sovereignty has become in China. 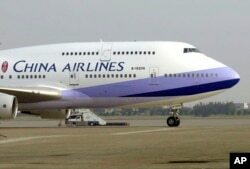 China's aviation authority said in January that it would require all foreign airlines operating routes to China to conduct comprehensive investigations of their websites, apps and customer-related information and "strictly comply with China's laws and regulations to prevent a similar thing from happening." Australia's Qantas Airways said in January that it had amended its website to no longer refer to Taiwan and Hong Kong as countries rather than Chinese territories after China issued a similar warning.